Since his endorsement, Collins has made the media rounds and served as an honorary co-chair of Trump's New York campaign. He also co-chairs Trump's committee to garner congressional support. "We have a lot of House support for Donald Trump," he said. 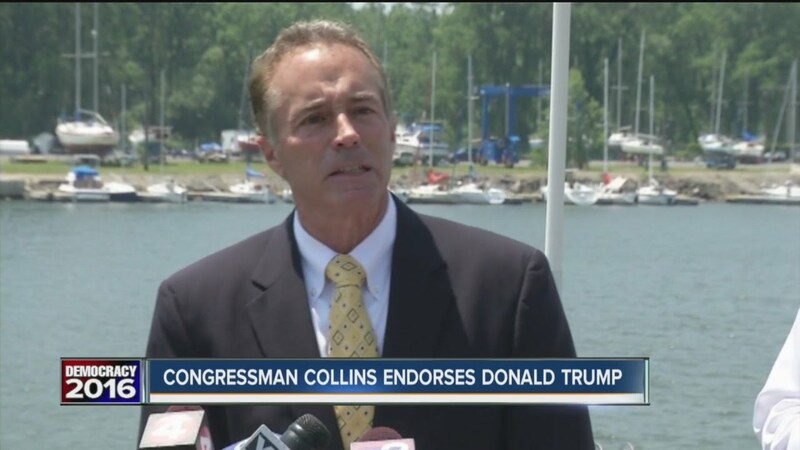 BUFFALO, N.Y. — Rep. Chris Collins isn't saying, "I told you so," but he could if he wanted to. The New York Republican was the first member of Congress to endorse billionaire Donald Trump for president — a lonely position back in February but one that seems prescient the morning after Trump swept New York's primary and moved closer to clinching the GOP nomination. Since his endorsement, Collins has made the media rounds and served as an honorary co-chair of Trump's New York campaign. He also co-chairs Trump's committee to garner congressional support. But despite Tuesday's victory, Collins doesn't expect a public wave of congressional endorsements to follow. Collins acknowledged that lawmakers in tight races do not want to be tied to some of GOP front-runner's statements. That doesn't indicate problems with Trump, Collins said in a Tuesday morning interview, but is a consequence of lawmakers wanting to maintain focus on their own candidacies. Collins, himself, disagrees with Trump's proposal to ban Muslims temporarily from coming into the country and his call to deport an estimated 11 million undocumented immigrants, but he aligns with Trump "philosophically," and believes the businessman can revitalize the economy. Collins will face Democratic businesswoman Diana Kastenbaum in November, but the Rothenberg & Gonzales Political Report/Roll Call rates the Western New York district as Safe Republican. Though he may not have to worry about re-election, he has earned newfound fame as Trump's first congressional backer. Collins often says America needs a "chief executive not a chief politician," which was his 2007 campaign slogan for Erie County executive. A successful businessman, Collins ran when the county faced a fiscal crisis, with parks and other facilities shuttered. Hochul, now the state's Lieutenant Governor, wasn't surprised by Collins' endorsement. “This is sort of two Western New Yorks. We’re in the urban area of Buffalo, which is definitely strong Hillary [Clinton] country … And then you get to the more rural area which is my congressional district,” Hochul said after she addressed Clinton volunteers canvassing in Buffalo. Collins' sprawling 27th district, surrounds Buffalo and its immediate suburbs, and includes 105 towns. The district has about 477,000 registered voters, with Republicans making up the largest swath at about 39 percent. Driving through the rural district, you're more likely to see lawn signs decrying the state's gun regulation law than a Trump campaign sign. But the Manhattan businessman's message resonates here. “Loved it, loved it,” Suzanne Lazzara, 49, a Trump supporter from Elma said of Collins' decision to back her candidate. Brandon Zarbo, a self-described moderate Republican from North Tonawanda who attended Trump's rally on Monday, also applauded Collins' endorsement. Not everyone was happy about Collins' endorsement, though. Collins said it "didn't hurt" that Paladino was backing Trump, but that he reached the conclusion on his own after Bush dropped out of the race.